Your quest for awesome family Halloween costumes is over...sort of. I've got the ideas, all you've got to do is supply the decision. Join into the fun this Halloween! Be prepared to have your clown shoes blown off and bow-tie to twirl. Flintstones are not among them. I promised unusual, not overdone. No matter how small or large your family is, (I've got ya covered, Duggars!) I've got plenty of tricks up my massive Princess Leia dress-sleeves. I will provide the ideas and leave you to turn them into a happy reality. I'll share the occasional link to a few particularly spectactular costumes I think you'll enjoy peeking at. blahbitty blah blah...let's talk family Halloween costumes! If there is just two of you in your family (or only one is willing to dress up! ), finding good theme ideas can be frustrating. Yes, you could go both as cats...or dogs...or lions...or even Justin Biebers!...but what's the fun in that? Dad as a bee, baby as a butterfly. Mom as the Fairy Godmother (think purple robe, pink ribbon), infant as Cinderella. 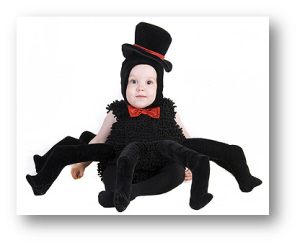 Mom as Little Miss Muffett, baby as a spider. Beautiful butterfly (jumbo wings do the trick) and squirmy caterpillar. Cowboys and Indians...with the four-legged family member as the bull. Role reversal: you dress as the baby, he's the parent! Mini-Me! Dress up your son/daughter as the spittin' image of you...or go blockbuster and pick up the real Dr. Evil deal. 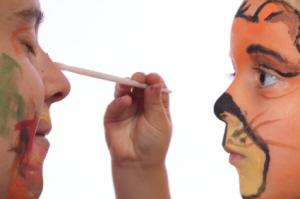 Include your other "little baby" in your search for the ultimate family Halloween costumes. 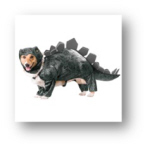 Here are two new dinosaur costumes out this year for smaller dogs. Just click on the pictures to see details. Aren't they hilarious!?! These suggestions are focused on the two-for-one family arrangement, but can easily adjusted by taking-away or adding on for siblings. 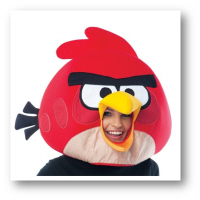 The popular Angry Birds app has launched some costumes this year. They include the character masks (shown) and full-blown costumes (click-through to see those on the site). Cops, robbers and one big bag of loot. King Kong, kidnapped Ann Darrow, and a banana. It's all about Angry Birds! Pirates with their little "treasure" or fluffy parrot. Parents as paleontologists, child as the dinosaur. Dad as a wolf, Mom as Little Bo Peep, and one little lamb. A Dashing White Knight, a Princess, and a scary dragon! Transform your little family into Muppets Take Manhaattan! Gaze at all the Muppet costumes (including Fozzie Bear and Animal) here. Finding family Halloween costumes with more than one child can be a lot of fun. 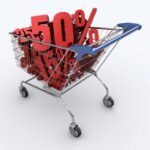 Here's a brief list of ideas to get your started on your brainstorm, followed up by some more specific examples on how these themes can really come together. Peter Pan, Wendy, and the Lost Boys (for sons) or Tinker Bell and the other fairies (for girls). Mr. Popper's Penguins provides plentiful proper apparel for your prebuscent progenies. The Farmer (and his wife) in the Dell. The kids all dress up as different farm animals. From a galaxy far far away...you can see family Star Wars costume ideas. The Lion, the Witch, and the Wardrobe: The parents are Peter and Susan, kids are Edmund and Lucy, baby is Aslan. Alice in Wonderland provides a huge range of options for family Halloween costumes. The creepy-weird Adams family costumes are perfect for Halloween, but often overlooked. It works best as a four-member family theme, with Mom as Morticia, Dad as Gomez, a daughter as Wednesday, and a son as Uncle Fester. Toy Story is one of my favorite all-time Disney movies. Fun for kids, hilarious for adults...it's such a great Family Movie Night happy compromise. I picked out a few of the most popular costumes to give you some ideas, but I still left out Bo Peep and Rex. 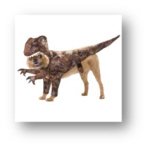 Not to mention all the other size options for the costumes I pictured below. 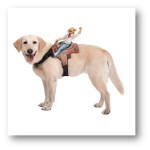 To search around all the Toy Story theme costumes, click on any photo below. Find the traditional costumes here. I'm talking lions, scarecrows, and tinmen, oh my! I have to tell you, honestly, that the whole Wizard of Oz theme for family Halloween costumes has been done to DEATH. ...Unless, of course, you think outside the box. Lucky for you, I'm claustrophobic. *The munchkins all use the same outfit, with each wig sold separately. These are not your typical Sesame Street family Halloween costumes! You're children will be thrilled, and you won't be hiding behind bushes in embarrassment. If you like the style of the little girl's Big Bird costume, be sure to click through and see similiar designs for Elmo and the Cookie Monster. They also have really trendy designs for tweens! ♥ Flitterific Baby Fairy Costumes: Which Matches Your Little Pixie Best?